Pierce Brosnan was a better Thomas Crown than he was a James Bond. He’s always radiated ease, elegance, and entitlement—not in an irritating way, but in a way that makes him hard to buy as a scrapper or a striver. Cinema has struggled to use his gifts appropriately: He seems to have suffered from the Jon Hamm problem of simply being so old-timey-matinee-idol handsome that it becomes difficult to cast him. 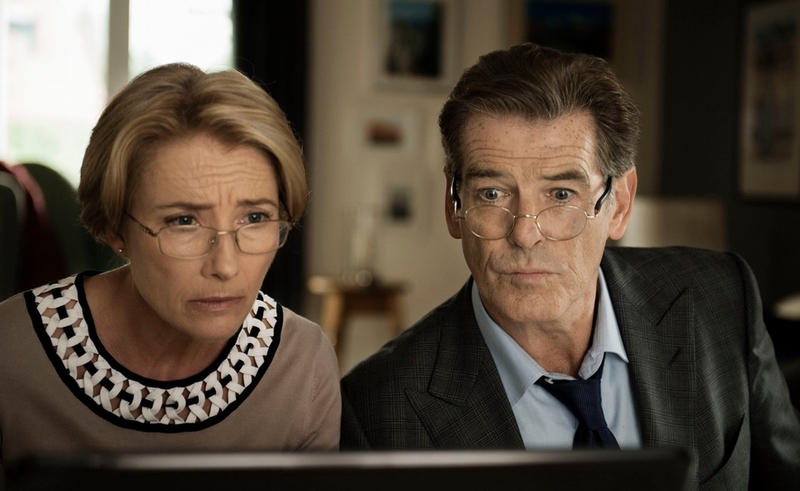 The amiable but maladroit (and bafflingly titled) romantic caper The Love Punch nods to Brosnan’s 007 Emeritus status by opening with a closeup of a martini shaker. But after that, it actually has a pretty good idea of what to do with him: It makes him the about-to-retire ex-husband of Emma Thompson, for whom he clearly still carries a torch. And who wouldn’t? She’s a natural comedian who always retains her dignity, even when the film around her barely registers. After Kate (Thompson) and Richard (Brosnan) split, she went vegetarian and finished her Ph.D., while he sought the reinvigorating company of a string of ladies, each decades his junior. Now, as the younger of their two kids prepares to leave for university in Edinburgh, empty-nest syndrome sets in on Kate. (“Let’s get drunk,” she proposes to her cat just after lunch.) Richard, meanwhile, discovers that his company’s mysterious new owners have sucked its coffers dry, taking his and Kate’s cushy retirement funds and their kids’ college money with them. (Like most rom-com couples, Kate and Richard appear to live very well before they’re swindled—and afterward, as well.) So he cajoles Kate into accompanying him on a desperate mission to gayeee Paireeeee to confront the hedge-fund manager who took their money and… ask him to give it back, maybe? Their impulsive, ill-planned jaunt is easy to accept, because after spending two scenes in their company, viewers should want nothing more than for them to have a romantic adventure in Paris together. But this is one of those movies that repeatedly requires its protagonists to do stupid things—things it’s already established they’re too smart to do—to prevent the plot from sputtering out early in the second act. They Skype their son at college to get him to hack the hedge fund’s website. Kids these days sure are great at the Internet!, the film seems to say; the family that engages in criminal conspiracy together, stays together, or gets back together, anyway. Once they find the hedge-fund creep—all handsomeness and privilege; he’s exactly the kind of thankless villain part Brosnan was getting cast in 20 years ago—he indulges them in some mustache-twirling before having them thrown out of his office. So it’s Plan B: Swipe the fist-sized diamond a celebrity magazine helpfully informs them he’s purchased at Sotheby’s for his fiancée. Like all McGuffin-gems, this rock is so famous and unique, it actually has a name, The Eye Of The Rainbow. Fencing that should be no problem, right? “What have we got to lose?” this attractive, well-spoken, smartly dressed couple with two unusually thoughtful and well-adjusted college-aged kids ask each other repeatedly, as though staring into each other’s half-open bloodshot eyes across a vomit-streaked bar-top. Given that a hotel desk clerk has been ordered to cut up one of their credit cards, they’ve clearly hit rock bottom. That’s a shame, because Thompson and Brosnan really are fine romantic foils. They deserve a better movie to trade barbs in. They deserve better barbs to trade. As their plot grows ever more Muppet-like in its absurdity, swelling to include kidnapping, SCUBA gear, mountaineering, and disguises, the movie’s key source of suspense becomes not whether Kate and Richard will rekindle the flame, but rather how many times writer-director Joel Hopkins will return to the hacky comic crutch of showing his middle-aged, sunglasses-wearing heroes walking together in slow-motion while some incongruous song blares on the soundtrack. He pulls this stunt twice in the space of four minutes, and not as part of the same extended gag. The second time around (strike one), the song is The Clash’s cover of “I Fought The Law,” which he interrupts with a record-scratch sound effect (strike two) so Kate and Richard and their longtime neighbors Jerry and Penelope can each announce in turn that they have to go pee. (Strike three). Ha! Ho! It’s funny because they are old. And because no one under the age of 40 has ever had to make a sudden detour to a restroom, especially when traveling in a foreign country. Hopkins doesn’t just overuse the Reservoir Dogs slow-walk, though. His reliance on pop songs—specifically, numbingly familiar 1970s FM rock hits—to set the tone at the top of scenes is pervasive. From any filmmaker not named Martin Scorsese or Cameron Crowe, this almost invariably plays like a desperate response to a poorly received test screening. When the Status Quo’s 1979 hit “Whatever You Want” plays over the breezily animated opening titles, it feels like a thoughtful selection—this is a tune that would’ve been on the radio when Kate and Richard got together in college, after all. And viewers could excuse the use of Bachman Turner Overdrive’s 1973 “Takin’ Care Of Business” on the same grounds, except that Hopkins uses a bland, recent cover version, not the one Richard and Kate would’ve known. The movie establishes that Free’s 1970 “All Right Now” is a significant song for the couple, then throws it away on a car chase that’s supposed to be funny, but isn’t. All the sloppy action sequence does is call out the fact that Mission: Impossible—Ghost Protocol wasn’t just a more thrilling caper flick than this; it was much funnier, too. Hopkins does pull off one memorably tender scene, where the two exes run into each other in an otherwise-deserted courtyard café. They each in turn receive a phone call from their daughter, but silently agree not to tell her they’re now in the same city, in the same restaurant, sharing the same small table. “Tell your mom I miss her,” Richard says, trying to get his ex-wife to meet his eye. It’s fairly obvious the second time will be the charm for Kate and Richard. And maybe, if we’re lucky, for Thompson and Brosnan, too.